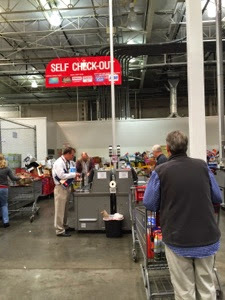 Maybe I never noticed it before, Charleston Costco has self check-out. I had less than ten items, but it was a hassle packing my own cart. Of course, I hadn't thought, but Costco self check-out does not have the bags set up the way that grocery store self check-outs do. At the end of paying, each item needed to be packed separately, loose in the cart. Self check-out here takes twice as long as at the grocery store, the time to ring the item up at the beginning and the time to pack it in the cart at the end. Most people using self check-out had only a couple items, in the future I would reserve self check-out for times like that.